When it comes to home renovations, replacing your roof probably isn’t something that you would think about very often. But that isn’t to say that it shouldn’t’t be on the list at some point in time. Unlessyour roof is actually leaking when it rains, or is showing obvious signs of rust or disrepair, you might not be paying much attention to it. However, it’s important to keep your eye on things if you are a homeowner to prevent further damage. 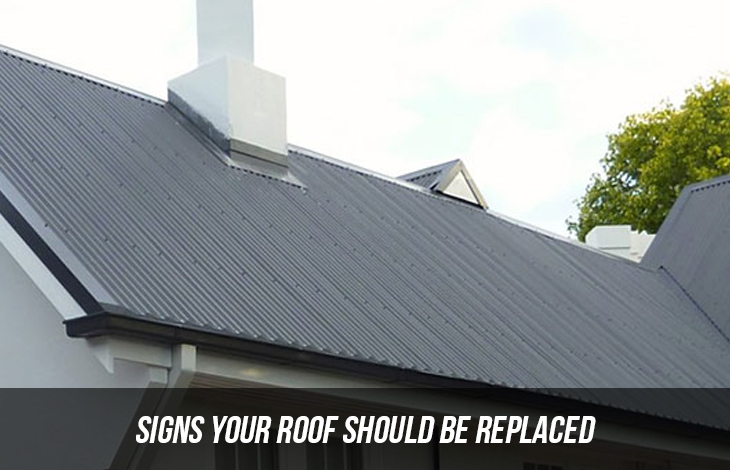 Here are some signs your roof should be replaced. Fashions fade, which is why many homeowners have decided to update their roof with a Colorbond Roofs or Zincalume roof. Maybe you want to match the neighbour’s roofs, or perhaps you just think that the old tile or slate roof that you have at the moment is just looking a little dated –either way, a roof replacement might be the go. There is still a fair amount of asbestos hidden away in homes all over the country. Asbestos is extremely dangerous. The particles that are contained within asbestos sheeting are toxic to lungs and can cause mesothelioma. If you are unsure whether your roof is asbestos, get a professional to check. Drip, drip, drip. There is nothing pleasant about a leaky roof! While a little leak may able to be fixed by patching it up, if it is a large section of your roof or you are finding leaks in multiple places then it may be a sign that your roof needs replacing. Get us to assess whether you need a full replacement or just repairs. All Roofing Services provides roof replacements, restorations, and repairs for Sydney and surrounds. Our Colorbond and Zincalume roofs are built tough for the Australian weather. If you would like your roof assessed to see whether it needs replacing then pick up the phone and make an appointment with us today.